Customer: Salamanca Group, Marina Port Vell, Barcelona, Spain. Project: Modernization of the port, exclusive and particularly secure IT and Internet infrastructure for the marina, 2010-2015. Application: Data network for port with FO backbone and salt-water-resistant copper cabling. IP67 protected, shielded Cat. 6A ISO network connections for moorings. Space-saving Carril DIN top hat rail assembly of the FO/copper systems. Since 2010, the Port Vell Marina in the middle of Barcelona has been extended and undergone extensive modernization. The Salamanca Group has transformed the former Olympic sailing marina into a world-class port for superyachts and exclusive guests for 100 million USD. The comfort and service offer in the new OneOcean Port Vell comprises club atmosphere, spa resort and sport studio, crew lounge and business hub. The challenges of the project included the provision of particularly secure and powerful communication, IT and network connections. The yacht owners, skippers, crews and their guests were to be offered a five-star infrastructure. In particular, the extension of the service portfolio required an IP connection to the yachts, an IP67 connection for every berth. But there was not very much space available to do so. The network components had to cope with the changing weather conditions of the Mediterranean coast and the harsh environmental conditions of salt water, rain, sun and sand at all times. The Spanish R&M partners CLAMASA Ingeniería Industrial y Servicios, S.L. and IEAISA Ingeniería IT developed a first-class solution for the Port Vell Marina providing all the required services and corresponding to the site conditions. R&M products were first choice for Francisco Escane, Technical Manager at IEAISA. Because they are well known for their functionality even in challenging environments. Robust FO cabling forms the backbone of the port network. It leads to the interconnection points at the moorings. 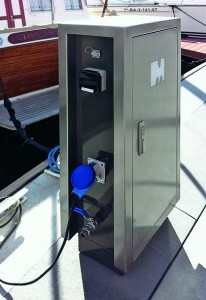 These are specially designed, narrow cabinets with connections for the yachts. Within the cabinets, the connection and distribution technology could be assembled on Carril DIN top hat rails – a space-saving solution. Salt-water-resistant cables and the shielded Cat. 6A ISO solution from R&M were selected for the copper cabling to the boat connections. The infrastructure of the Marina Port Vell is a luxury product that perfectly matches the elegant yachts, the elevated requirements of the international users and the five-star service of the port. Even the cables bear the name of the port, demonstrating its clear exclusivity. With the complete cabling solution from R&M, the Marina Port Vell is perfectly equipped and can offer its open sea clients top-class services.